On 26th April we will have a New Moon at 6° in Taurus, apparently with no major aspects in the sky. As described in the previous blog, everything is seemingly in a state of silent interlude, where nothing happens, but many things are stirred up and in the process of being revealed. The key to this heavenly map is hidden in the background of the Sun and the Moon, which are conjunct the Fixed Stars Schedir, which is associated to the heart/breast of the Goddess Cassiopeia, and Hamal, located in the forehead of the Ram. Esoterically the past is associated to the Moon, the old personality, and the future to the Sun, the soul, embracing each other in front of the Fixed Star Schedir in the breast of Cassiopeia, the Queen of Ethiopia. 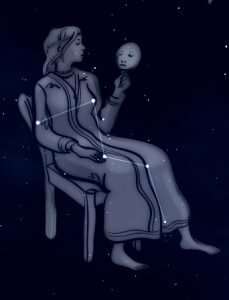 According to Oswald Wirth, this constellation is associated to the Tarot card La Papesse, the metaphysical woman sitting on a throne and holding the keys to the mystery of the cause of life and Divine knowledge. When we stand in front of her, it means that we are ready to receive a higher revelation about the unseen cause behind the manifested life. She is asking us to die to everything we aspired to achieve and become, so that we may be truly alive. We normally experience our being alive only through the sensations coming from the senses; we know ourselves because the senses tell us what is around so that we can act accordingly. Without the guidance of the senses we feel a sense of dread, because we experience the complete unknown, but our little mind does not realize that this is the Divine, or what lies behind the veil standing at the back of her throne. This card is associated to number 2, which refers to the great space and it is symbolic of the subconscious mind, which we have to face in order to see the truth and raise beyond the preoccupations of the little personality. Cassiopeia made the mistake of bragging that she was more beautiful that the Nereids, the enchanting sea nymphs, and for that reason she became a symbol of the personification of vain, meaning that she was holding on to something that was empty, false and idle. In the silence of our mind the High Priestess is asking us to name and face our true motives and to have the courage to dive in where our emotional and mental reactions take us, to allow ourselves to experience the sense of guilt/victim, so that the soul can show us the truth and disperse the shadows of the past vain desires. The book that she is holding in her hand represents the Book of Life, which symbolizes truth. As we rise in consciousness, we can no longer hold on to the old mind-sets/desires that made us act they way we did in the past. Seeing the truth means that we have to become aware of what we were, of the hidden motives at the basis of our own past actions and realize that these were not unconditional but moved by a personal urge. This is called the intense purification of sulphur: the silver key in her hand represents the intellectual knowledge which has to refined by the golden key, which, in alchemy, represents the burning and the dissolving of anything that is impure and not eternal in order to transform it into wisdom. It is a painful purification occurring in the silence of our minds, where everything with no value and that is a lie is going to be destroyed. 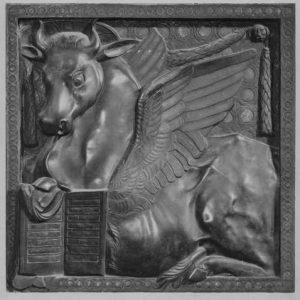 The Fixed star Hamal in the forehead of the Ram highlights this aspect. The Ram rules the head and it talks about the liberation from the thought-form holding us in captivity. 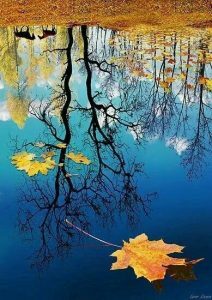 It is about realizing that what we see in the outer world is within us, so that we may face the shadow within – our hate, our regret and our pain – and become aware of the input of our inner relationship with the outer world. The forehead of the Ram may be associated to the pituitary gland, which is related to the Ajna, the lotus with two horizontal petals, or third eye, referring to the integrated personality, which later become the personality infused by the soul. 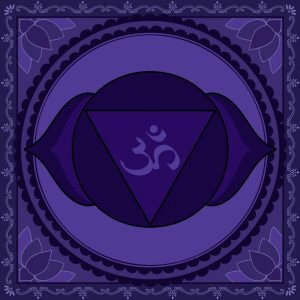 The word Ajna means command and knowledge; in the Indian tradition this chakra is described as “the eye of wisdom” or “the mind’s eye”. The two petals are symbolic of Ida and Pingdala, the two major Nadis of the body, which are associated to the Moon and the Sun, the form/personality and the soul. The message of this New Moon is about letting go of any false desire of the personality to experience a new level of being, the quality of the soul, so that we may merge with a higher level of perception. We cannot enter the new life until we have released what holds us in the past. This would not possible if this lunation did not mirror us back what we have to face. “Man know thyself”, be aware of your own behaviour, which is driven by your subconscious, because this is the only awareness that may bring the opportunity of change. It is about being honest with ourselves and have the courage to face the truth. On one level, it will bring elevation and uplift, while, on the other, rebellion and fall. As Claudine Aegerter affirms in her book “The Spirit of the Tarot,” we are asked not to live a double life, for in the process of lifting the veil of illusion we have to be honest and true all the time. We cannot pass through the veil without meeting the iron gates of death of what is vane and, until the veil is torn off, we cannot stop but only go forward without looking back. Love dissolves what is false to reveal the truth. Love opens the gates of the divine within us and uncovers the lies. We can only be alive when we welcome the soul within and start living from it, when duality is transcended and the personality has been infused by the inner light: “I see, and when the eye is opened, all is illumined,” is the highest achievement of Taurus. This is a necessary step for the new life to unfold. As we die to the illusion of what we think and feel we were, the hidden truth of the soul will be revealed to us. Love is the key and, when we truly love, we are in the heart of God. I died as an animal, and I became human. When was I ever less by dying?